Who pays if a tree falls in your yard? You might never consider it unless it happens to you, but tree ownership is an important consideration – who is responsible for branches, roots, trees that are dying, and damage if something were to happen? Who actually owns these trees, what, if anything, are the rules about cutting roots and branches that extend into your property? Can you cut a tree down if you think it is dying? If a massive storm knocks your neighbor’s tree into your yard, will they have to pay for the cleanup? These are just a few answers to some common questions. Who actually owns the tree? According to the Forestry Act of Ontario, a tree whose trunk is on the edge between both properties belongs to both property owners. When can you trim a tree? It is possible for both owners to trim branches, if these branches are on THEIR side of the property. Please keep in mind that you cannot step foot onto your neighbor’s property in order to trim these branches and roots. If you have a tree that is entirely located on your neighbor’s property but the branches and roots extend into yours, you are allowed to trim these – only if doing so will not harm the tree. With branches, this can be easy to determine, but what about with roots? How can you determine whether cutting off the root will harm the tree? What if you want to build a pool, but find that the tree roots from your neighbor’s tree extend into your yard? Do you have to make the pool smaller…move it altogether? The rule of thumb is that the determination of how far away from the root you can dig is made by the diameter of the tree trunk. In Toronto, you can dig two meters from your neighbor’s tree trunk, provided it is less than 30 centimeters. What if the tree is dying? If you believe that a tree is dying, you want a certified arborist to get you a report that states as much. 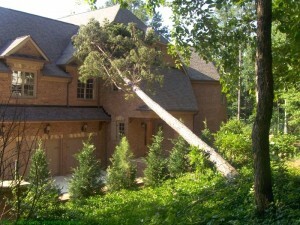 In most cases, you will not need a permit to remove a tree from your yard after that. However, before taking down the tree, you still need send the city a copy of the arborist’s report. What if a tree falls? What happens if a tree comes down and damages your property? This largely depends on whether the tree was healthy, or whether you have told your neighbor before that you thought the tree was dying. If the tree was healthy, you cannot see your neighbor according to case law then it is a matter between you and your insurance company. However, most insurance policies are not going to cover that type of damage. However, you can claim your losses successfully if you can prove that you warned your neighbor that the tree was dying and they did not take steps to prevent this from becoming a problem. The city typically owns most trees that are within 15 feet of the road. This means that you cannot legally cut any branches or remove the tree altogether. If you believe that the branches can cause damage, you have to notify the city. They will then remove the tree altogether or trim the branches. Next post: What is our credit history?